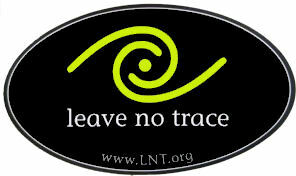 Learn “Leave No Trace” wilderness ethics by way of practical application on an overnight camping adventure and become qualified to be a Leave No Trace Trainer. Master Educators Marshall and Barb Dunham will help you develop a sense of appreciation, respect and stewardship toward our wilderness by teaching you the seven basic LNT principles. Participants will then be prepared to teach the LNT curriculum. Course limited to first 10 participants! Class 3 Physical required. Fee $40.00 which includes meals and materials.